We've moved from Baltimore, Maryland USA to Venice, Italy in pursuit of living our dream! Carnevale 2015 officially began last weekend with the Festa Veneziana- a two day fun festival designed for locals, scheduled before the masses of tourists from all over the world descend upon Venice for the big events. Not much Carnevale transpired in the days between Festa Veneziana and today, kind of the lull before the storm - and that's a good thing because all of Venice spent the week battling what seemed like endless acqua alta (high water), rain and high winds. Between now and February 17, Venice will be teeming with tourists, many donning elaborate costumes and masks participating in both masquerade balls and daily costume contests in St. Mark's Square. When you think of Carnevale, thoughts usually turn to masks, costumes, elegant balls and parades. I thought I'd focus on something much smaller, almost inconsequential, but yet fundamental to Carnevale. Confetti. You cannot escape confetti during Carnevale. It is one of the harbingers of the season. When I begin to see a bit of it in the streets, usually beginning around 3 weeks before, I know it won't be long before Carnevale is here. And before long, all the streets are covered with it. 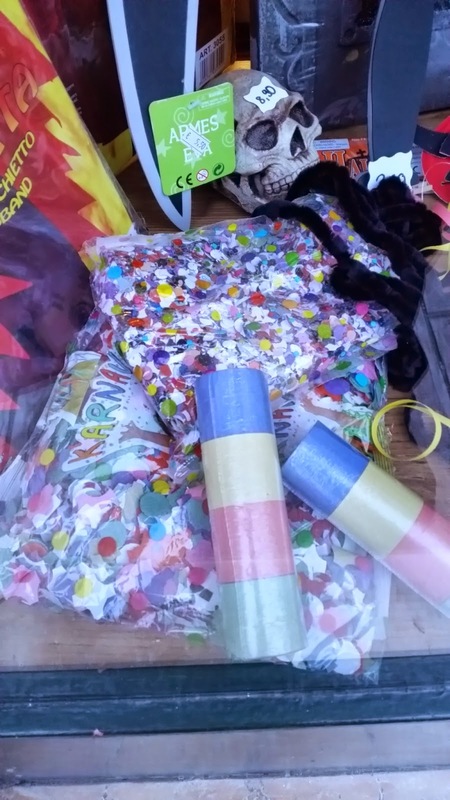 Confetti can be purchased in every Tabacci shop for around 1 Euro per bag. Any self-respecting Venetian child wouldn't be caught dead without their own supply, at the ready to be thrown at friends, parents, nonna and nonno, dogs, strangers. Well, at anyone or anything, it doesn't really matter. The stuff just has to be thrown. Batman and big sister are armed with bags of the stuff, and Mom is even carrying a back-up supply when theirs run out. Its one of those little things that just make you happy when you see it. You just can't help yourself. I see confetti every year, stuck in cracks all over Venice from January to March. I don't know why this year was any different, but for some reason I started to wonder about confetti. Who thought up confetti in the first place? Wikipedia, the font of all knowledge, provided answers. I thought I'd share some fun facts with you. All over northern Italy as far back as the middle ages, crowds threw things at Carnevale parades. Things like balls of mud, eggs, coins and fruit. Earliest documentation of this tradition is traced to Milan in the 14th century. In 1597 throwing objects at Carnevale events was banned by the Governor of Milan, Juan Fernandez de Velasco (just in case you get this question during a game of Trivial Pursuit). The tradition was revived during the 1700's, however the eggs and mud balls were replaced with candy coated coriander seeds. Coriander was a common plant in this region at the time. And- just so you know- Coriandoli (the Italian word for Coriander) is what confetti is called in Italy. So how did we go from candies to paper pieces? In 1875 Enrico Mangili, a Milanese businessman, started selling paper discs to throw at Carnevale. At this time, Milan was a large manufacturer of silk. Mangili collected the small punched paper circles that were the leftovers from paper sheets used by silkworm breeders as cage bedding, and sold them- at a profit, of course! Mangili's paper confetti made a pretty big hit, being less harmful, more fun, and a lot less expensive than the other objects being used at the time. 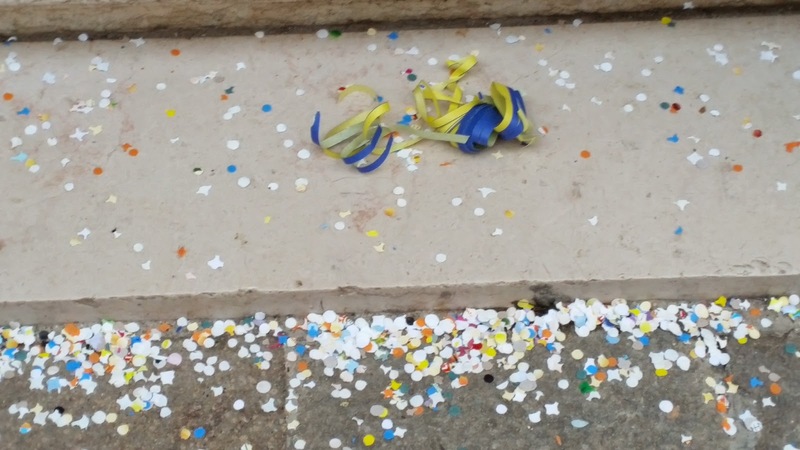 It didn't take long before paper confetti became the object of choice all over Northern Italy. And there you have it- the birth of paper confetti. One more little tidbit- the word Confetti is used in Italian, but it refers to candy coated Jordan almonds, which also used to be thrown at Carnevale, but today are more commonly given out at weddings, baptisms and graduations. So there you have it- a little fun fact about Carnevale, and two new words to add to your Italian vocabulary : Coriandoli and Confetti. Admit it, it does make you smile, doesn't it? It cheered up my day! My only complaint as an native English speaker is the use of tidbit instead of titbit. A small linguistic difference that I am proud to acknowledge from the eastern side of the pond. Tim- Do the British really say "titbit"?? Ey yay yay! ah, we missed it. we were napping in between carnival adventures. thanks for covering it so we could see it. Seeing those colorful pictures made me smile. Thanks Karen for continuing to keep us updated on Carnevale 2015! After planning for a year, we've finally moved to Venice in January. We're living our dream !